My sentiments as well. After they found their passports, they're in dead last. Hopefully Keri and Lance ain't the second last team.. if not it will be hard to watch these 2 get eliminated. Yep, an "amazing" newspaper, in fact probably The Daily Amazing Race. And the dog photo and headline are no doubt references to the family dog, a JR terrier named Jetson. I hope someone kept a copy!! I re-read the spoilers for this leg and the person who took pictures, captured a "red team" who is believe to be Zev/Justin from a distance running up stairs to where the pitstop was, then 10-15 minutes later the globetrotters and then not sure how long but after some time Ericka and Brian showed up. The person then states they stayed around a bit long (doesn't state how lonng) and then leftt. So if there was 10-15 minutes with Zev-Justin and the person saw two other teams arrive, then why wasn't Zev/Justin spotted leaving to go search for their passports? Maybe a total of 20-25 minutes passed during the time the person was there or maybe a little bit more? You would think that Zev/Justin would have been spotted by the same person leaving especially if that amount of time passed. What do you think? and perhaps Zev/Justin left through another way but you would think they would go back the same way where their taxi dropped them off. Just an early guess: teams have to find a scroll/picture/plate depicting the queen somewhere inside the Russian market, then take the scroll with them to the pit stop. Not the full promo but heres what I have .. Thanks, Puddin. It matches the departure board at Tan Son Nhat: 7:17 pm, if that means anything. Hi guys, I've been visiting RFF since I discovered the site about 3 episodes past in TAR Season 14. I have to say I admire the enthusiasm most people here put into posting. Your research skills maybe at par with TAR researchers, maybe better. Thanks very much for the infos. Zev & Justin out of the Race? No. Don't do this to me again. Based on the lateness of the confessional and the Pit Stop photo with Lance & Keri, I think they are out next. I wonder: would they be eliminated even if it was a non-elimination leg? Even in HD I can't get a read on it Slowhatch, but thanks! This was taken on July 25, around 3pm to 3:30pm. 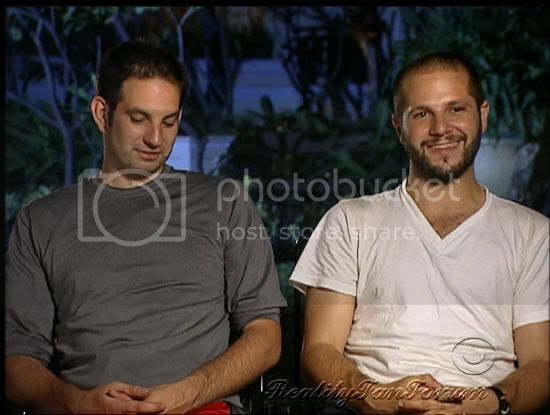 I can help but wonder why Zev & Justin look "happy" in this confessional. CBS has spoiled this too well and in the past CBS used mis-direction. I guess Zev & Justin just had time to adjust to the fact that they are out of the race. Is it possible to see who came in first and last. From the spoilers is looks like The Globe Trotters and Meghan & Cheynne are First and Second again this leg. I think what happens is that Justin and Zev arrive 5th or 6th and have to search for their passport and get eliminated because Lance & Kerri, Mika & Canaan and Maria & Tiffany arrive right after them. Leaving Lance & Kerri in last place, but being saved due to Zev & Justin loosing their passport. Could it possible be this incident refering to a lance & kerri again being saved for another week. "The only Thing to Fear, Is Fear Itself"
Is Meghan waving around a bag? or cloth? maybe collect items? Well, we know they are in the Russian market, so probably have to find some different items? The appearance of the Switchback? Because this reminds me of the Baragwanath Market RB, but it doesn't really scream 'difficult RB'. Plus, if the Switchback did appear this episode, I'd think they'd hype it like mad. I'm holding out for haybales. BVM invented that one himself, so seems specially likely that might be chosen. He LOVED that challenge, loved the drama. There's zero chance of a Switchback this week because this is the first time a leg has had tasks in Phnom Pehn. (The last Cambodia leg was at Ankor Wat.) The Netherlands is still a possibility, but I agree that at this point, it looks to be the haybale roadblock in Sweden. Raymond, extending what the Schnauzers said a bit, the Switchback was never an option for Phnom Penh unless WRP allows the task to be in a new geographic setting, which I doubt. The only Amazing Race ever in Cambodia was AR13 at Siem Reap and Angkor Wat. There will not be time on this next episode to do Phnom Penh and get up there too. Besides, there were no infamous ROADBLOCKs in that area. The echo chamber at Angkor Wat was one of the lamest ever and not suitable to be a Switchback. Page created in 0.082 seconds with 33 queries.